A Junior Scientist explains the diet of Florida black bears at the Imagine Our Florida, Inc. booth during the 2018 St. Petersburg Science Festival. 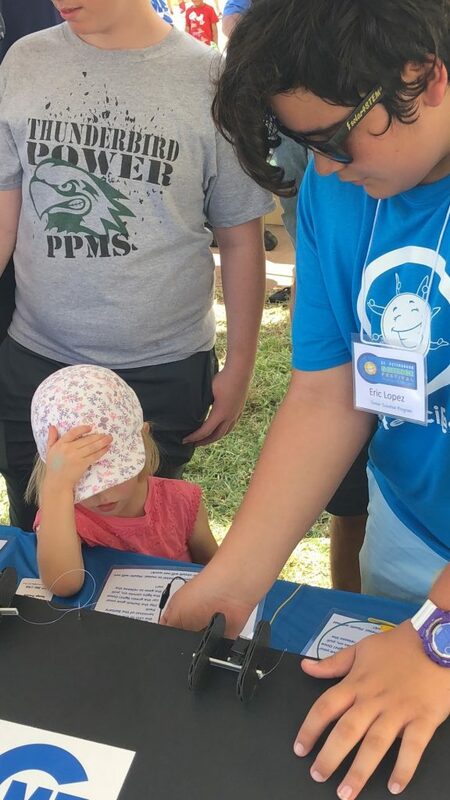 ST. PETERSBURG, FL – At this year’s St. Petersburg Science Festival, held in October, a number of especially young faces in volunteer T-shirts joined the ranks of exhibitors as the Junior Scientist Program completed its fourth year. Developed in 2014 by Drs. Ileana Freytes Ortiz, Abdiel Laureano Rosario, and Lindsey Dornberger, students of the USF College of Marine Science (USFCMS) at the time, and Ph.D. Candidate Dinorah Chacin, the primary goal of the Junior Scientist Program was to enhance volunteer participation in the St. Petersburg Science Festival by extending the offer to middle and high school students. Ileana, Abdiel, Lindsey and Dinorah wanted to bring young students into contact with science by providing them with real, hands-on experience as they work alongside scientists and other exhibitors participating in the Science Festival. The Junior Scientist Program is currently led by a team of three organizers with ties to USFCMS: PhD candidate Dinorah Chacin, and doctoral students Loraine Martell-Bonet and Natalia López Figueroa. The program has grown each year and has diversified, as well – a trait that the organizers, natives of Puerto Rico and Venezuela, see as a tool to increasing diversity in STEM career fields. The experience this year has been surreal for Natalia as her nephew, who she remembers teaching about chitons and other marine organisms during trips to the beach when he was a child, became a participant in this year’s program. What the organizers want most for the program is for the Junior Scientists to learn. To learn a bit of the science they will be explaining to visitors but also learn what it’s like to be a scientist by shadowing grad students, teachers, and scientific professionals during the Science Festival. First year students on the program don’t necessarily know what to expect, but after returning for a 2nd year or more, they really sink into the position and have a lot of fun with it. Because the Jr. Scientists are minors, a requirement for them to participate in the St. Petersburg Science Festival is that they have a chaperone. Natalia and the group of organizers received a letter from a very excited student who did not yet have a chaperone. After explaining the rules, the student managed to get a chaperone and was given the OK to join the Science Festival. Natalia heard more of the story from an acquaintance at a wastewater treatment plant where that same student now works as an intern, “This student was so excited. She was like, ‘OMG! I got into the Jr. Scientists! It’s my last year to volunteer. I can’t believe it!’” relayed Natalia. This reaction encouraged the organizers and let them know that the program is already gaining public awareness and that students are thinking of the program as a way to fulfill their internship goals. Junior Scientist, Eric Lopez, helps a young festival-goer at the Solar Car Race booth. Students come mostly from Pinellas County, although this year saw 3 new students from New Port Richey (Pasco County) who had just found out about the program through Facebook. One student even came from Orlando! At Mr. Powers’ school, entry into the Junior Scientist Program is limited to students who participate in the STEAM activities (Science, Technology, Engineering, Art of design, and Mathematics). 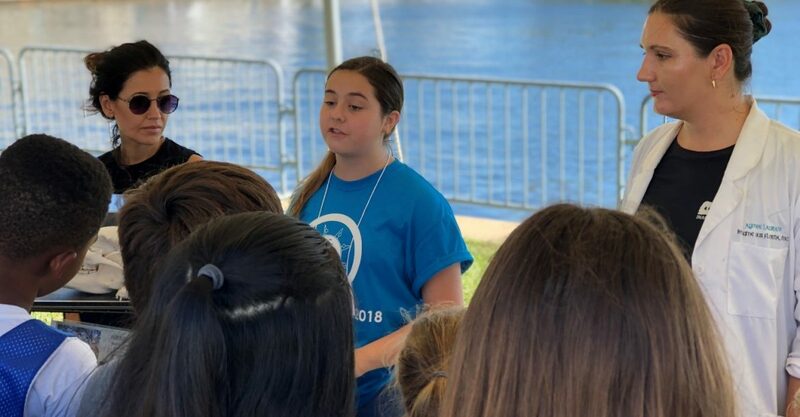 Jennifer Giuffre, Magnet Program Coordinator at Bay Point Middle School in St. Petersburg, is a veteran chaperone of the Junior Scientist Program. “This is our fifth year,” she shared. Ms. Giuffre has students who are now seniors that have participated in the program since they were in middle school. As a chaperone, she gets in a lot of steps on the day of the festival, checking on her students and making sure they’re engaged. In addition to recognizing the students’ enjoyment in getting out of school for the day, Giuffre was impressed by the satisfaction the students displayed in taking responsibility for teaching the festival visitors and for helping the scientists maintain the booth exhibits. Bibiana Bellora, a high school junior, is most impressed by what she learns in the chemistry classes at her school. So, as a participant in the Junior Scientist Program, naturally she gravitated towards the exploding foam and other chemical reactions enacted at the Science Festival. She wants to be a doctor – a neurosurgeon, specifically – but has some concern over the length of time to complete such intensive medical training. 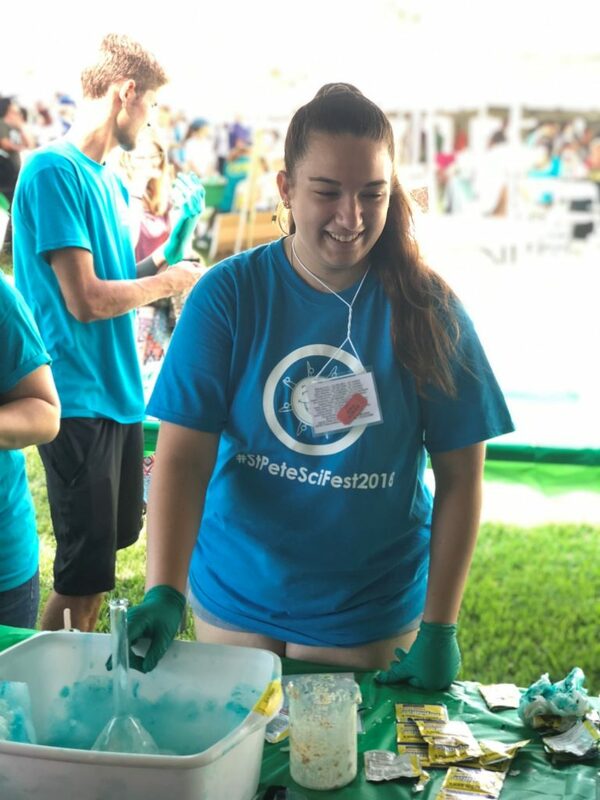 Bibiana Bellora, a Junior Scientist, works the chemical reaction table at the USFSP pavilion during the St. Petersburg Science Festival. Bibiana’s mature attitude towards her future career possibilities is a shining example of the talent that is nurtured by the Junior Scientist Program. When the program began, the creators had no idea how successful it would be or how much it would impact the lives of the students who choose to participate, but after four years of success, and looking forward to a fifth, the organizers of this program are filled with a sense of accomplishment and motivated by the excitement expressed by the Junior Scientists, the next generation of scientists, engineers, designers and technologists.